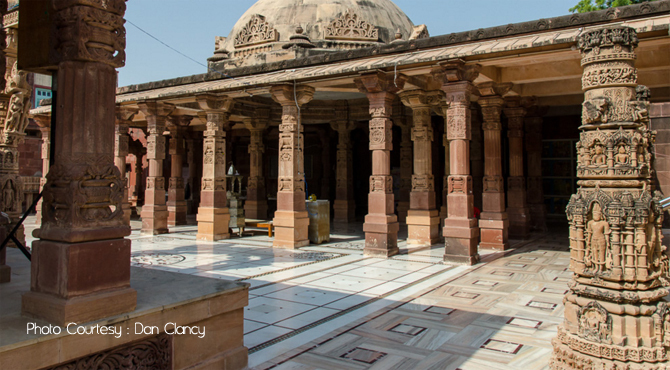 The ancient town of Osian, situated 65km North from Jodhpur is an archaeologists delight. Located at the verge of the Thar Desert, at Osian, there are cluster of not less than 100 Brahmanical and Jain temples belonging to 8th and the 11th century. Beautifully sculpted and designed, these temples are the largest and the best preserved temples in state. The city of Osian is said to have founded by Utpaladeva, a Rajput Prince of Pratihara Dynasty. It is a major pilgrimage center for Oswal Jain community. Osian is also known as Khajuraho of Rajasthan. Even though the time have damaged these temples to an extent, still their charm attract lots of people. The temples includes at Osian are Jain Temples, Sachiya Mata temple, Surya temple, Pippala Devi temple, Harihara temple etc. These temples are grouped in several sites, North, West and South of the town. The southern group of small Hindu temples includes three Harihara Temples. It is dedicated to Lord Harihara (A union of Lord Shiva and Lord Vishnu). Among the three Harihara Temples, the first two were constructed in the 8th century and the third one was built in 9th century. Raised on huge plinths these temples has beautiful sculptures. Compared to the other temples in Osian, Harihara temple's architecture is far more advanced. The west group contains a mixture of Hindu temples, including the Surya Temple. Built in the 10th century, it has beautifully carved pillars. It is similar in structure to the Sun Temple at Ranakpur. Dedicated to Sun God, the temple's inner sanctum, containing the striking idol of Sun God. The main hall contains idols of Lord Ganesha and Goddess Durga. The temple has ceilings decorated with the images of serpents coiled around lotus flowers. 200m further, the Jain Mahavira Temple built in 783 AD, by Pratihara King Vatsa. Stands on a hillock, it is dedicated to Lord Mahavira, the 24th Jain Tirthankara. The best preserved of the temples here, Mahavira Temple is famous for its stunning architecture. Built of red stones, it has beautifully carved images of Gods and Goddesses. Stands on a high platform made of sandstone, it's main shrine contains the deity 'Mahavira' in the Padmasana posture. Nearly 32 inches high, this idol was installed by Acharya Ratnapradhasurishwalji. The main door is carved with an impression of young maidens and the main porch has intricately carved pillars. The temple also has three balconied windows. Besides these Jain Temple, there are other Jain temples here, which are quite smaller and are uniform to some an extent. The other famous temple at Osian is Sachiya Mata Temple, a perfect example of the medieval architecture. Built by Parmar King Upendre in the 8th century, it's present structure was built during the 12th century. It is dedicated to Sachi Mata (wife of Lord Indra. The temple complex has two other shrines, the Chandi Ka Mandir and the Amba Mata Mandir, that are dedicated to Chandi Devi and Amba Mata respectively. Built in many phases, Sachiya Mata Temple can be entered through a series of wonderfully sculpted arches.The interiors of the temple are decorated with beautiful images and sculptures of deities. At the north-end of the complex is a sculpture of Varaha (boar incarnation of Lord Vishnu) whereas an image of Lakshmi-Vishnu is visible in the east. Pippala Devi Temple at Osian is a 9th century temple. Comapred to the other Osian Temples, it is very small. Apart from its artistic temples, the Osian is also known for its camel rides.